Drilling into a new economy? What’s got him thinking so big? Laumb, principal engineer and coal utilization group leader at UND’s Energy & Environmental Research Center (EERC), says it’s all about reducing carbon emissions while enhancing oil recovery and benefiting the environment at the same time. Jason Laumb and the EERC are working with industry partners on a $6-million project to determine the cost of installing a carbon-capture system at a coal-powered utility plant, the Milton R. Young Station power plant near Center, N.D., northwest of Bismarck. The idea is to use such a facility to capture carbon dioxide and use it to enhance oil recovery by injecting it deep into the ground, where it would be forever stored. Image courtesy of Kari Suedel of the EERC. To help facilitate this result, Laumb and the EERC are determining the cost to install a carbon-capture system at a coal-powered utility plant, the Milton R. Young Station power plant near Center, N.D., northwest of Bismarck. The power plant provides electricity to power cooperatives throughout eastern North Dakota and northwestern Minnesota. “Burning fossil fuels produces primarily CO2 and water,” Laumb said of the power plant. 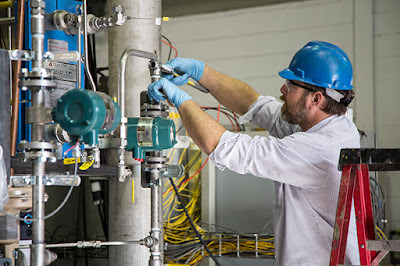 “We’re looking at grabbing the CO2 out of the flue gas, and using it for enhanced oil recovery.” Injecting the gas into oil reservoirs, he said, lowers the viscosity of the oil so it flows easier through the pores of tight rock, boosting oil well output. The carbon dioxide used in the process is then permanently trapped deep in the reservoir. This is just the beginning, Laumb said. The goal is to complete the initial project and see if it’s cost-effective, and then continue with final design and construction plans. There’s already a small test pilot project at EERC headquarters on the UND campus. The $6-million project was funded by the U.S. Department of Energy’s National Energy Technology Laboratory. It’s a collaborative effort, with an additional $1 million from the North Dakota Industrial Commission’s Lignite Research Program and $250,000 each from ALLETE Clean Energy (ACE), a power supplier in Duluth, Minn., and Minnkota Power Cooperative. Other partners include technology vendor Mitsubishi Heavy Industries, and an engineering firm, Burns & McDonnell. The EERC’s partners provide financial backing, engineering evaluations, site access, operations data and risk assessment and evaluation, Laumb said. He added that strong support also has come from state and federal elected officials, key regulators, labor unions, coal mines and other electric utilities. In addition to determining design and cost estimates for a new carbon-capture facility, the EERC also hopes to gather more information on economic benefits of carbon-capture equipment and related technologies. The results will support the U.S. Department of Energy’s goal of reducing carbon-capture costs to $30 per metric ton by 2030. It also could lay the groundwork for the largest integrated postcombustion CO2 capture facility in the world. Laumb thinks the project’s technology could transfer to other power plants in the nation. A new carbon-capture industry would benefit all of North Dakota, Laumb said, as well as have a positive effect on the environment. So why is this such a big idea? This article originally ran in UND Today on April 12, 2018 and was written by Jan Orvik.